The magnetic-impulse cavitation reactors ROTON are the result of the latest developments of our company in the field of physicochemical mechanics and sonochemistry. In the reactors ROTON, cavitation is created by the magnetic-impulse hydrodynamic method. This is the most effective, patented way to create cavitation directly in a fluid stream. The cavitation cloud is held by the magnetic field precisely in the area of ​​the reactor in which the treatment takes place and has an immediate effect on the raw materials passing through the cavitation reactor. It ensures high efficiency, reliability and durability of our reactors. Unlike traditional methods of cavitation production using ultrasonic emitters, the cavitation reactors ROTON allow cavitation processing of any liquids in a continuous flow with high performance. The magnetic impulse cavitation reactors ROTON show high efficiency in the production of various extracts using food-grade solvents, such as ethanol, oil and water. There are no other analogous devices which provide such quality homogenization, deep extraction and capacity combined with low energy consumption. 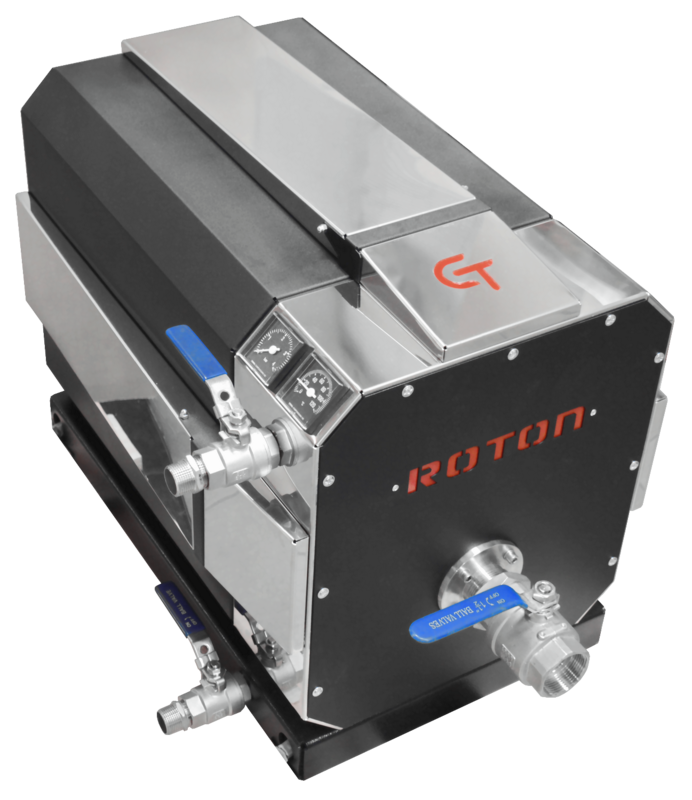 The cavitation reactor ROTON can process liquids with a viscosity of up to 1000 cSt and above with a capacity of up to 8000 liters per hour, any combination of various liquids and liquids with solids with the minimum hydromodulus of 5. Solid inclusions can be various – whole grain products, plant seeds, fruit pits, eggshells, small crustaceans with shell, dry crushed plants, etc. Extracted biologically active substances contained in plant and animal raw materials play a great role in maintaining and stabilizing the important biochemical and physiological processes of the human body. Extraction of plant materials is currently carried out by inefficient, time-consuming and complex methods. Classical method for isolating biologically active compounds from plant materials is extraction with the use of toxic solvents, and there is always the problem of solvent residues separation from the extract, which can lead to partial or even complete destruction of some components of the extract, as well as contamination of the final product with non-food chemical compounds. Butane is a toxic substance. There is no possibility of its 100% removal from the extract. Low yield due to batch processing (portions). High energy costs and high cost of equipment for re-liquefying the solvent. Ultra-high pressure (from tens to hundreds of atmospheres). High cost of equipment (compressors, high pressure vessels) and high energy costs. CO2 is a non-polar solvent. Selective extraction, frequent loss of useful components. 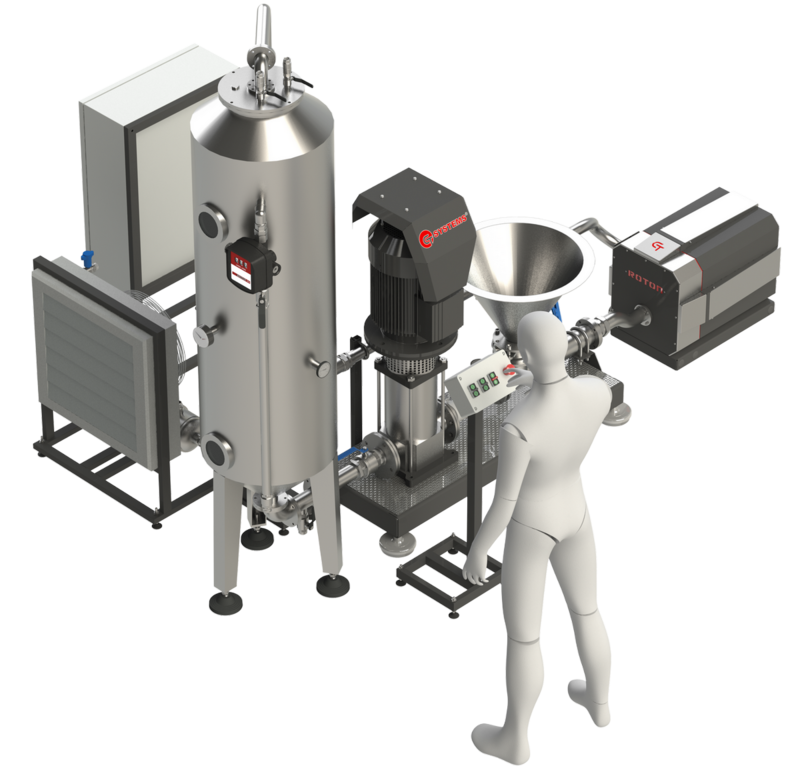 High processing performance of raw materials in the flow, unlike traditional batch processing. Significantly lower extraction cost compared to traditional methods listed above. Universality of the technical process. On the same equipment, extraction of various types of raw materials without reconfiguring the process line is possible. Increasing the degree of extraction through the destruction of cell membranes. Cavitation mechanically destroys the cell wall by shear forces, facilitates the transfer of mass from the cell to the solvent. The reduction in particle size through cavitation increases the contact surface area of the solid and liquid phases. Use of non-toxic polar solvents (alcohols, water and ethers), as a result, the possibility of extracting more complex compounds. Safety of the extraction process – no high pressures, no toxic solvents. Esterification of organic acids with the release of ethers in the extraction process, which are more easily absorbed by the human body. Receiving of organic materials only – only 100% of natural ingredients are involved in the extraction. The reactors ROTON can be used to homogenize and/or disperse different types of raw materials. Ethanol extraction of plant and animal raw materials. One such example of solving a very complex extraction problem is the extraction of krill oil from krill flour. Krill oil is a very valuable and expensive food additive, more effective than fish oil. The active nutrients of krill oil are Omega-3 fatty acids, phospholipids and astaxanthin – the most powerful natural antioxidant. All these three types of substances have different solubilities in polar and non-polar solvents. Traditional extraction is carried out with at least two different solvents in two stages. Moreover, one of these solvents is necessarily non-food. Therefore, all samples of krill oil available on the market cannot be certified as an organic product. Our company, using the unique cavitation reactor ROTON, has developed and tested the technology of flow cavitation extraction of krill oil with food-grade ethanol. At the same time, in one stage, it was possible to simultaneously extract fats, phospholipids and astaxanthin. All the parameters of the extract meet market standards for krill oil. A second example is obtaining of medical cannabis extract. Such extract contains almost no narcotic cannabinoids, but it contains a significant amount of cannabidiol (CBD) – a very useful substance that effectively helps to get rid of stress, insomnia, alcohol or drug addiction and has a number of therapeutic effects. The preparation of cannabis extract in our cavitation reactors is made with the help of food-grade ethanol 95.5% and more than 95% of cannabinoids are extracted. Cavitation processing of specially prepared oak chips for cognac production allows accelerating the degree and depth of extraction of oak wood components into cognac alcohol ten times. All this ultimately leads to products with improved organoleptic properties manufactured in a shorter period of time. Aqueous non-reagent extraction of humic substances. When processing raw materials in the reactor ROTON, processes of dispersion, extraction, dissolution, disintegration of cellular structures, cellulose destruction occur simultaneously. The result is an increase in the efficiency of the final product without the use of chemical reagents. High-performance waste-free production of juices, purees, pastes. This technology allows processing of vegetables and fruit, such as tomatoes or citrus fruits with the skin, as the grinding occurs at the micro level. Processing takes place without air access while preserving all components of the fruit chemical composition, including insoluble ones: fiber, protopectin and fat-soluble pigments. Due to the complete preservation of the constituent parts of raw materials, the value of juices with pulp is higher than that of clarified ones. Production of liquid complex fertilizers. This technology allows introducing micro- and macroelements into a concentrated aqueous solution of humic acids to produce complex humic fertilizers with different content of plant nutrients. Processing of wort mash in the reactor ROTON increases the efficiency of beer production due to greater isolation of extractive substances of malt and raw materials saving, improves the quality of beer wort, has a positive effect on the fermentation process and the quality of the finished beverage. Pasteurization and simultaneous homogenization of milk, juice, beverages, etc. Homogenization of protein-fat milk drops to a size of 1-2 microns. 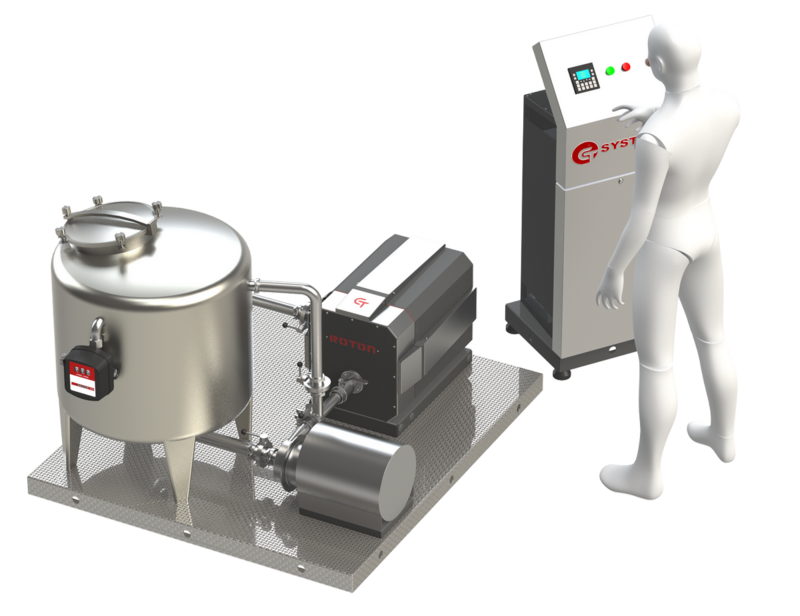 Cold cavitation pasteurization with guaranteed destruction of bacteria while preserving vitamins. The cost of electricity for the processing of the milk flow in the above-mentioned process is ten times less than in traditional plunger homogenizers with powerful electric drives. * Maximal capacity – permissible value of flow of liquid which passes through the reactor where the minimum cavitation processing of liquid is sufficient for most of emulsification, dispergation, extraction tasks occurs. ** Nominal capacity – flow of liquid passing through the reactor by which the effective cavitation processing is generated to perform the complex technological tasks: emulsification on molecular level, dispergation of solids in a liquid, maximal extraction with food solvents (water, ethanol, oil). The reduction of flow results in increase of cavitation processing time with simultaneous heating of processed liquid, that allows the performance of the special production tasks.